The ideal addition as swing set accessories and jungle gym accessories. Can also be used for building your very own rock climbing wall in your backyard. This is a 25 piece set of plastic climbing rocks can be used on an indoor rock climbing wall. Whether you are adding on to an existing play set or replacing worn out rock climbing holds this set will work for you. -Mounting Hardware & Bolts for a standard 1 inch installation. These are intended for the use with standard residential swing sets or jungle gyms and should not be used to go higher than a standard playset. Not designed for commercial use. If you have any installation questions or concerns please contact us and we will be happy to help in any way that we can. We have a 100% satisfaction guarantee. SUMMER FUN OUTDOORS: Active kids are healthy kids. These climbing rocks are a great way to get children to climb and play outside! STRONG DURABLE DESIGN: These climbing holds are made of high quality, strong, and durable plastics so that you know that your kids are supported and safe. 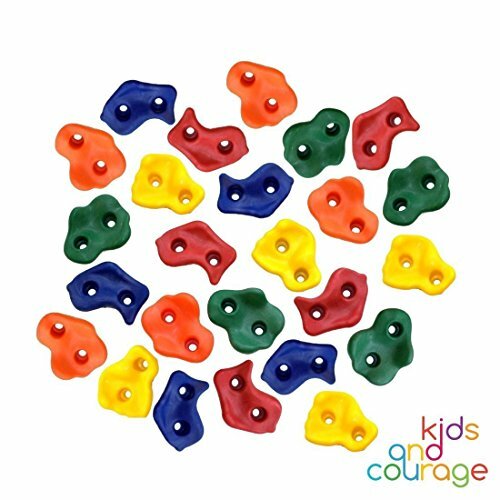 ACCESSORIZE YOUR SWINGSET: These 25 assorted rock climbing holds are designed to replace worn out holds or add new holds on to an existing playset or swing set. EASY TO GRIP: These rock climbing holds are textured so they are easier for children to grip and hang on. 100% MONEY-BACK GUARANTEE - These rock climbing holds are backed by a 100% guarantee that you are fully satisfied with your product or you will receive your money back. If you have any questions about this product by Ruby's Creations, contact us by completing and submitting the form below. If you are looking for a specif part number, please include it with your message. Crash Pad - Large 5' X 5' with Extra Washable Removable Cover - New (A $49.95 Value) Special Pricing!